Traditional school safety techniques had students huddling in locked classrooms and waiting for rescue if danger approached during school hours. But tragic lessons in Newtown, Conn., and Columbine, Colo., have given rise to new recommendations from the U.S. Department of Education for keeping students safe: Run away and hide, they say. Or if you have to, fight. The new school safety protocol for staff and students is “run, hide, fight,” a major shift from the static classroom lockdowns campuses have followed for years. 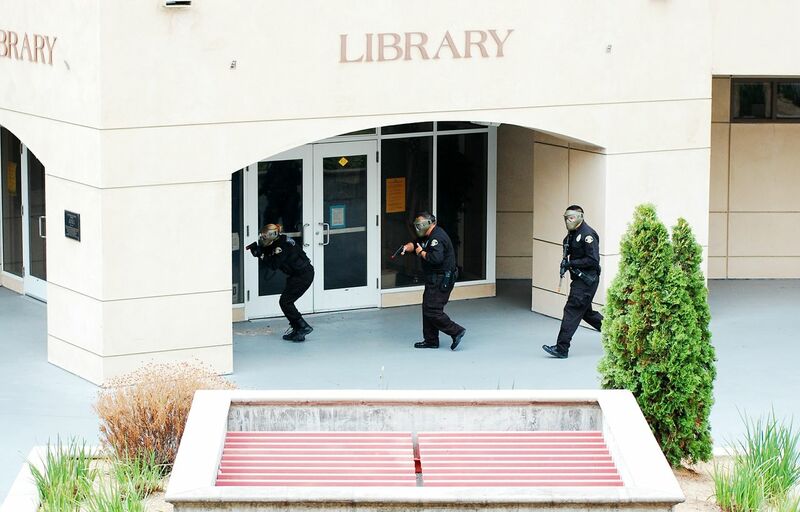 The procedure asks teachers and staff to take a more assertive role in trying to survive the unlikely event of an “active shooter” situation on campus. As part of back-to-school preparation, educators throughout California are being trained in the technique, which includes giving teachers the leeway to ignore lockdowns requiring students to be kept inside, to run off campus with students, and to unleash a fire extinguisher on a person with a gun. “The idea is that instead of being passive and being executed, be active and perhaps save your own life and the lives of others,” said Arthur Cummins, who sits on the board of the California School Resource Officers Association and is an administrator for safe and healthy schools at the Orange County Department of Education. The impetus for the new approach comes from lessons learned from the school shootings in Newtown, where a former student shot and killed 26 students and staff at Sandy Hook Elementary School in December, and Columbine, where two students shot and killed 13 students and staff in 1999. But what would “running” look like on campuses with hundreds or thousands of students? “Chaotic,” acknowledged Hall, whose Kern County Office of Education oversees 47 school districts and 178,000 students. But in some cases, it’s the best alternative, he said. Hall acknowledged that teachers, staff and students at Sandy Hook Elementary did “a lot of things right” in trying to stop the gunman and save students, but a mindset of searching out options for survival is helpful for teachers to have, he said. But if the worst happens, schools want to be ready. “There are three basic options: run, hide, or fight,” states the Guide for Developing High-Quality School Emergency Operations Plans, released in June by federal agencies including the Department of Education, Federal Emergency Management Agency and the Federal Bureau of Investigation. The guide was promised to schools by President Barack Obama as part of a follow-up to the fatal shootings at Sandy Hook Elementary School in December. “You can run away from the shooter, seek a secure place where you can hide and/or deny the shooter access, or incapacitate the shooter to survive and protect others from harm,” the guide states. While all schools are required by the state and the federal government to have safety plans, schools are not required to adopt the “run, hide, fight” protocol, which was issued as a guideline. Still, many districts, in addition to Los Angeles Unified, say they are offering trainings or will be offering staff trainings in some form of “run, hide, fight.” Kern County held trainings for administrators and staff in the new protocol in April and May, with representatives of 35 education agencies in attendance. Other districts include Norris School District, Capistrano Unified School District, Hermosa Beach City School District and Newport Mesa Unified School District. 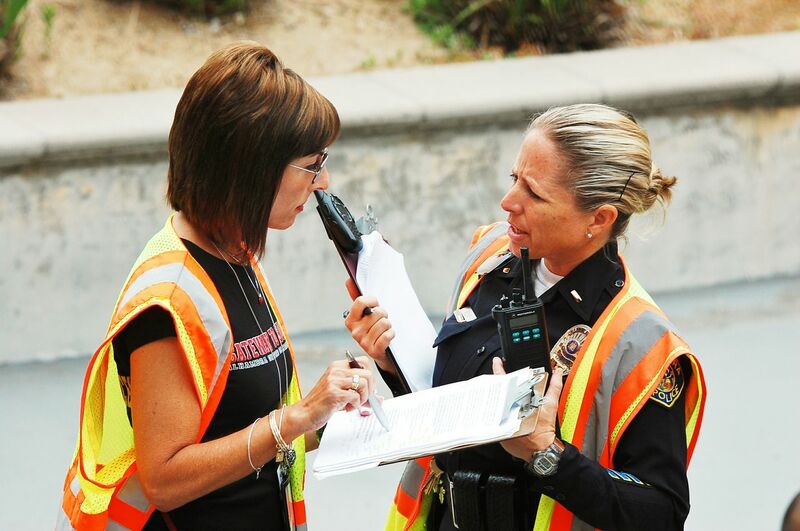 Grappling with the potential danger of an active shooter on campus is a shift in mentality that brings up some tough emotions, said Patricia Escalante, superintendent of the Hermosa Beach City School District. 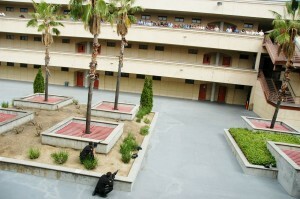 In June, the Alhambra Unified School District held active shooter simulation training at Alhambra High School, with a school counselor playing the part of a student with a gun, administrators and principals responding, unscripted, to the scenario, and Alhambra police rushing on campus after the call. The simulation was watched by 350 school staff and administrators, including 150 custodians and more than 50 bus drivers, teachers and other staff to be trained as part of professional development workshops this year, said Laurel Bear, director of the district’s student safety and services program, Gateway to Success, which coordinated the simulation. Another 100 people from a variety of school districts watched an excerpt of a video of the simulation as part of a training in “threat assessment” this month. The Alhambra active shooter simulation did not include the “run, hide and fight” protocol. “I think it gets mixed reviews,” Bear said. Bear also noted that a focus on preventing violence on campus is critical, and effective tools include identifying emotionally troubled students, providing immediate assessments and referring students and families to counseling. While it is impossible to predict whether a student will become a perpetrator of violence, she said, students who commit acts of violence on campus share a sense of disconnection from school, family and life. Improved relationships among students and staff, as well as improved counseling services, go a long way toward keeping students connected to school, she said. Jane Meredith Adams covers student health. Contact her or follow her @JaneAdams. Thank you for the article. As a teacher it is hard to think beyond the routine but harder as a person not to want to fight back to protect these innocent children. Keith mentioned running and hiding to safety as a good idea – just make sure the kids know what it should look like and sound like before returning to “base”. Thank you again! As a teacher that is retired military this makes sense. I heard stories that what we were doing in Newtown actually caused more deaths. When we huddle children in corners one bullet actually goes through several children. But when they run away it takes several bullets to take one down. School districts need to make accomodations with other nearby community agencies to evacuate to each other in this situation. A semi-organized sprint together to the other location will save lives. Get away from the shooter asap. Those trapped in the actual area of the shooter need to fight back by throwing the kitchen sink at him and allowing as many as possible to run away and find a good hiding place. Police at the scene need to pair off and immediately search for the shooter. Waiting outside for the SWAT takes too long, 45 minutes to and hour and is causing more deaths too. Nice article on school safety. This policy change will definitely create a lot of commotion in schools and the way students live. Thanks for reporting this and writing an article about it, because it’s really important that we know about it. It’s great to know that teachers and children have a Constitutional, and now policy, right to “Run, hide, [and} fight” because we can’t do anything to control the unfettered “rights” of others to weapons designed for combat. Probably these plans need to take into account the local community and the architecture of the school as well. For example, a classroom with two doors is a liability for shelter-in-place but an asset to a run-and-hide strategy. The fire extinguisher is a great idea and a dual-purpose item – good for distracting an attacker, and something every classroom should have on hand anyway. Probably a good idea to have a campus session every year or two with practice on actually deploying and using a fire extinguisher, especially when they’re about to be recharged anyway.